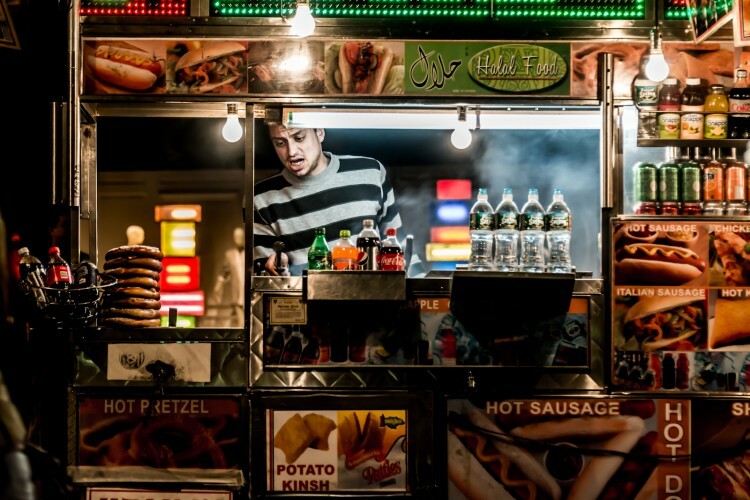 New York City is full of food vendors, in parts of the city you can’t go a block without seeing one or more. 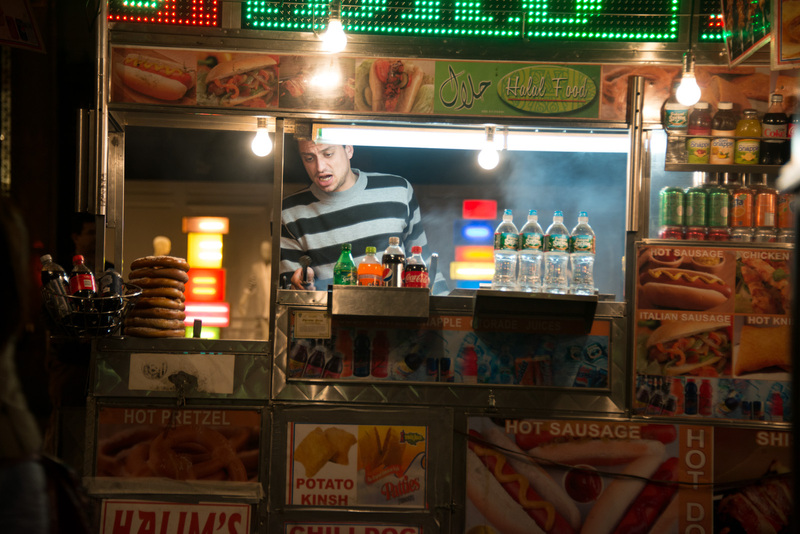 This guy was set up just outside of Rockefeller Center on 5th Avenue. I shot this from the sidewalk as I walked by. Processing was pretty simple. I made a minor rotation correction in Lightroom, did some tweaking of the highlights, contrast etc to adjust the look and add a bit of richness to the image. The biggest change was created by using extreme settings in Clarity and Luminance noise reduction. The Clarity slider in Lightroom 4 has improved greatly and you can achieve some interesting effects by pushing it to 100. Previously you had to be more careful with Clarity because it could introduce some horrible artifacts. Lightroom 4 is much better. The image was shot at ISO 1000 which had some noise, but the D800 is pretty clean but I wanted to use the noise reduction in a more creative way. By sliding it to almost 100, it imparted a slightly ‘plastic’ look to the shot which I liked. Ha! I got a hotdog from this guy It was good too, and I didn’t even get sick! Sweet job on the processing BTW. Wonderfully detailed image, James. Your use of the clarity and luminance sliders in Lightroom has brought out all of the inherent detail in the scene and yet still left the ethereal qualities to the steam especially around the bare light bulbs. What a terrific transformation James. Well captured and processed. Great image, James. I really like the Richness of the scene, as you mentioned. You and a few others have sparked my interest in Lightroom. But having just pre-ordered Adobe CS6 design and web premium, I probably will stick to PS for awhile. What a great capture James! I am looking forward to taking my D800 out for some night street photography! The ISO ability is staggerinly good. The D800 does have some great high ISO capabilities.